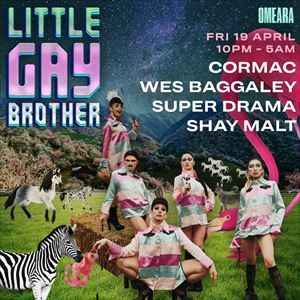 Little Gay Brother is back at Omeara in London Bridge for their Easter Rave-up! Expect all the usual suspects and nutbaggery from the Little Gay Brother fam including Drag Queens on treadmills, breathtaking lewks, and superstar DJs that will make you sweat on the dancefloor until 5 am. Cormac, fresh from his closing set at Panorama Bar, has firmly established himself as one of dance music's best-kept secrets. We welcome him back to London and can't wait for what he has planned for us. Little Gay Brother is a Queer Rave for Everyone. A party, without prejudice. Our nights are open to anyone, as long as you're open to everyone. We ask all joining us to respect each other and have a lovely time. The doors open at 10:00 PM, and the last entry is 3:00 AM. No show tickets will be re-sold on the door after 1:00 AM, if ticket holders are not in the venue. Little Gay Brother advises that ticket holders should aim to arrive at Omeara between 10:00 PM to 11:30 AM, if you wish to avoid busy queues upon entry and do not want your ticket to be re-sold. This ticket does not allow queue jump. Please print your ticket or have your e-ticket ready in the queue. Omeara door security conduct personal and bag searches on the door of the club, in accordance with UK law. Search is a condition of entry. This is to keep our guests safe. It's your right to choose whether a male or female member of staff conducts this search. Ask on the door for more information or message the promoter via their Facebook. If you need to talk to one of the Little Gay Brother team, come to the reception or see our door hosts on the night. Come join the family. GET INTO IT!